The following interview was conducted by George Vassiliou with His Eminence Metropolitan Hierotheos of Nafpaktos. It was originally published in Επίκαιρα της Αιτωλοακαρνανίας, then republished in Paremvasis (April 1998). What is the meaning of Orthodox Holy Week? Holy Week in the Orthodox Church is the center of its life, its heart. It is preceded by a period of fifty days of asceticism, fasting and prayer, and after Pascha there follows another period of fifty days. In the first period the primary meaning is our preparation for a worthy veneration of the Cross and Resurrection of Christ, and in the second period that which dominates is the struggle to process with spiritual "digestion" this heavenly food. If one examines that every Sunday we celebrate the Cross and Resurrection of Christ, then they can understand that the spirit and atmosphere of Holy Week dominates more than half of the annual cycle and, to express myself better, the message of Holy Week and Pascha permeates throughout the year. The Orthodox Church proclaims that the death of the God-man on the Cross is the salvation of the human race. I would like you to make a comment on this salvific event. In the Orthodox Church we talk about the death by crucifixion of Christ as being connected to His Resurrection. This is because the Cross without the Resurrection is a hard and dire reality, and the Resurrection without the Cross is a false and emotional state. When we speak of the salvation of the human race, we do not mean an abstract or stochastic concept, but it is the deliverance of man from the tyrannical and horrible prison of death, sin and the devil. By His Cross and Resurrection Christ conquered death, sin and the devil, and in this way He gave us the power to overcome these three enemies. We should primarily note that by the sacrifice of Christ and His Resurrection we can overcome our mortality and createdness. From the day we are born we have in our biological existence death, which is manifested in many forms, such as in sickness, in the corruption of the body, in our insecurities, in the advancement of our age, in the passions for self-preservation, in avarice, etc. All people spend their life in the process of death. The child at the age of 8-10 years understands that death is an irreversible fact. The teenager sees the torture of death. The middle-aged see the years pass without purpose or meaning. And the retiree is going through a terrible crisis, proceeding towards his death. The Orthodox Church with its emphasis on the Resurrection, gives an outlet to the existential void in man. How can we as Orthodox understand the meaning of the Crucifixion and Resurrection of the Lord? The answer to the previous question shows how little we understand existentially these great events. That which I want to emphasize is that there are different ways to approach these events. One approach is the logical and historical process, to read about how these events unfolded. Another is to approach them emotionally, to see, that is, the pain and suffering of Christ. Another approach is to participate in the whole process through the manners and customs, to live them, that is, folklorically, to satisfy the children's experiences. However, the Church with the period of Great Lent seeks to help man approach it existentially. A theology that is not related to the existential anguish of man, and his deliverance from it, does not have value or meaning. For one to see the problem of death in their existence, as manifested by the tyranny of the passions, and to seek to heal it with repentance, which is a change of mind and lifestyle, is to partake of the Cross and Resurrection of Christ. The feelings which prevail in the dramatized events of Holy Week are mixed. Pain walks alongside with joy, indolence with alertness, sin with forgiveness, betrayal with love, the fall with redemption, death with resurrection. Do you believe these feelings are a challenge for the contemporary world, especially young people? First let me tell you that in the Church we are taught how we can alter these emotions into deeply spiritual experiences. Because, as you know, there are differences between feelings and emotions. The first are deep spiritual existential situations, while the second are superficial pleasures. Indeed, these contrasts between pain and joy, indolence and alertness, sin and forgiveness, etc. are a formidable challenge. People, especially young people, mostly walk one-way, becoming a so-called "one-dimensional man". I want to say that contemporary people are usually pained and betrayed, feeling unsuccessful in life. It is terrible for a young person to feel alone, sad, hurt, uncomfortable and inconsolable, feeling the depressing weight of sin, experiencing an impasse in life. And yet the Church shows us the way to overcome the impasse by suggesting a way out. Today we need consolation, supplication and hope. And God exhorts: "Supplicate, supplicate for my people." Through the perspective of supplication and consolation we see the events of Holy Week and Pascha. To watch the harlot woman immediately become wise, since she loved Christ. To see the thief, the criminal, become the first citizen of Paradise. Too see the disciple who denied Christ become the Foremost Leader of the Apostles. Is this not a great consolation? How would you briefly describe the events of the Divine Drama? If one reads the synaxarion for each day they will see in detail what we celebrate each day of Holy Week. If I could make a brief analysis, I would say that all the facts show two realities or truths. One is the aggression and hatred of man towards the truth, and the other is the "aggressiveness" of the truth and love towards hate. As Father Justin Popovich would say in the past, man sentenced God to death and God "sentenced" man to immortality. Hatred and insecure aggression always show weakness, while love and voluntary crucifixion reveal the power of the spirit. People today see enemies everywhere and feel their neighbor to be a threat to their existence. Christ showed us that the enemy is not just outside of us, but within us is our traumatized freedom that acts as nothing and not as love. He also taught us that the presence of others is not a threat to our existence, but a "prophetic event", since the other is our brother, our joy. Sartre said: "Hell is other people." The Saints, through the example of Christ, exclaimed: "Christ is Risen, my joy!" What is the message that emanated from the empty tomb of Christ for the people of this broadcast? Henry David Thoreau, referring to the information of his age (1854), said that the newspapers offered "nothing new". He emphasized that if one reads of an incident, a robbery, a murder, etc. then nothing else needs to be read. "If you are acquainted with the principle, what do you care for a myriad of instances and applications? To a philosopher all news, as it is called, is gossip, and they who edit and read it are old women over their tea" (Walden, ch. 2). Walter Benjamin (1938) says that modern information is in reality "short disconnected information". He writes characteristically: "It is virtually impossible to write a history of information separately from a history of the corruption of the press" (The Paris of the Second Empire in Baudelaire). How much more is this the case for contemporary information! But the empty tomb of the God-man offers old and always new information, about death that is conquered, about real life that springs up from death, about the kenosis, the sacrifice and the offering. It is probably better to say that the empty tomb of Christ does not only offer information, but even better - that life has conquered death. 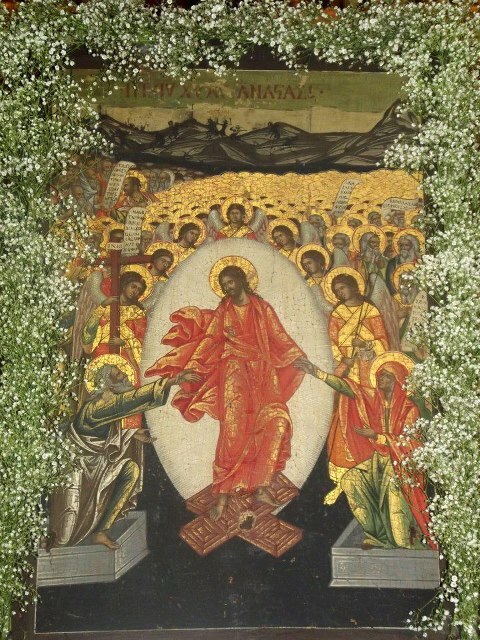 Broadcasts run on created light and make people aware of the surface, but the empty tomb of Christ shows the uncreated Light, which illumines the darkness of Hades and fills all of creation with light. So while the channels of information satisfy the senses, the empty tomb of Christ gives rest to the spiritual senses, and reveals life beyond the senses. Do you believe the contemporary world can attain the realization of the Resurrection? What is the message you would like to send, as a Hierarch, to young people? What we have said so far shows the position of the spirit I want to get through in this interview. What I would like to emphasize at this point is that there exists a revolution occurring with hatred and the energies of the Beast of Revelation, and there is a resurrection occurring with love and the energies of the Lamb of Revelation. Christ by His Resurrection made the greatest revolution in history. Not every revolution is or leads to Resurrection, but the Resurrection in Christ Jesus is the true revolution, in the sense that the word "revolution" (επανάσταση) comes from the verb επανίστημι and shows the return (επάνοδο) of humanity to their first-created beauty, the restoration of humanity to our previous glory, and our resurrection from the Fall. Christ was sacrificed and arose not to do some spectacular action for His own personal exaltation and glory, but to become the medicine for mankind. When medicine is found for a sickness, then we rejoice because then every sick person can be remedied. Likewise, Christ with His Cross and Resurrection became a more powerful medicine, "the medicine of immortality". All of us who are dominated by death can get rid of its dynasty and live the Resurrection. This was lived by the Saints, so can we as well. Finally, I want to say that the Book of Revelation shows us the energies of the Antichrist, but also the glory of Christ; the mark of the Beast, but also the seal of the Lamb; the wickedness of the Beast, but also the people of the Lamb; the destruction of creation, but also the renewal of creation. The end of Revelation is the triumphant victory of Christ over the Antichrist, the new heaven and new earth, and new people only with the new Christ, Who makes all things new, and makes all things without corruption for all things to remain new, in our life, in our mindset, and in all of our existence.